European and Asian high-speed rail manufacturers are courting U.S. government officials in hopes of securing contracts for some of the $8 billion dollars of federal stimulus funds ear-marked for domestic high-speed rail (HSR) projects. According to Greenwire, foreign manufacturers are hosting country visits for federal and state government officials to see their high-speed train technologies, as well as dropping not-so-subtle hints that they will build new domestic manufacturing facilities, or expand existing ones, if they are awarded contracts. States are also feverishly competing for federal funds. 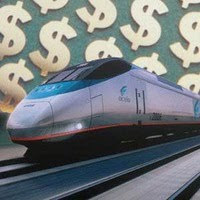 According to NPR, forty states and the District of Columbia have already filed applications requesting more than $100 billion for high-speed rail projects. The most ambitious project is a proposed $40 billion, 800-mile HSR network in California spanning from Sacramento to San Diego. Although the Federal Railroad Administration has yet to award any of the $8 billion in government funds to any state or project, companies from Germany, France, Canada, Japan, and China are hoping that early efforts to charm government officials will pay off down the road. Notably absent from those promoting their HSR technologies are American companies. That's because the United States ceded international leadership in the transportation technology in the 1960s, when Japan became the first nation to construct a national high-speed rail network. A recent Breakthrough Institute report, "Rising Tigers, Sleeping Giant," notes that the United States has no domestic manufacturers of high-speed rail technology, and "will rely on companies in Japan or other foreign countries to provide rolling stock for any planned high-speed rail lines." By contrast, the other countries examined in the report--China, Japan, and South Korea--all have domestic high-speed rail designs. Indeed, most of the HSR technology and equipment that will be used in new U.S. high-speed rail projects will come from other countries. While the U.S. stimulus's "Buy American" provision would require most of the assembly of the rolling stock to occur in the United States, according the Greenwire story, "most of the work that lies at the heart of the system would be done outside the United States, with firms simply revamping existing technology to meet the needs of the U.S. market." The Breakthrough Institute study notes that any domestic HSR projects will require international imports, but that the United States could decide to pursue a strategy of domestic technology development and technology transfer arrangements in order to localize the production of high-speed rail technology. Similar strategies in China and South Korea have enabled the successful development of domestic high-speed rail and nuclear power industries. Should state and federal governments in the United States decide to support the creation of a national high-speed rail network, a domestic technology development strategy could pay off for U.S. manufacturers, as such a network would require investments in the hundreds of billions of dollars. Given that the United States is so far behind its competitors in high-speed rail technology, it may end up importing most if not all of the technology for new domestic HSR projects. But even if manufacturers decide to sit out the race for HSR markets in the United States and around the world, the U.S. experience with high-speed rail should serve as a cautionary parable for the perils of government complacency in growing clean tech markets. The United States has sat and watched as Japan, Europe, and now South Korea and China have surged ahead with new HSR technologies, developing new domestic industries. We are now paying the price for our complacency with yet another clean tech import and a widening trade deficit in manufactured clean-tech products. Without more direct government investment to grow a domestic clean tech manufacturing base, the United States could see many more clean energy technologies, many of which were invented here, commercialized and widely produced elsewhere. The United States can ill-afford to allow this process to repeat itself if it hopes to compete in one of the largest future growth sectors of the global economy.